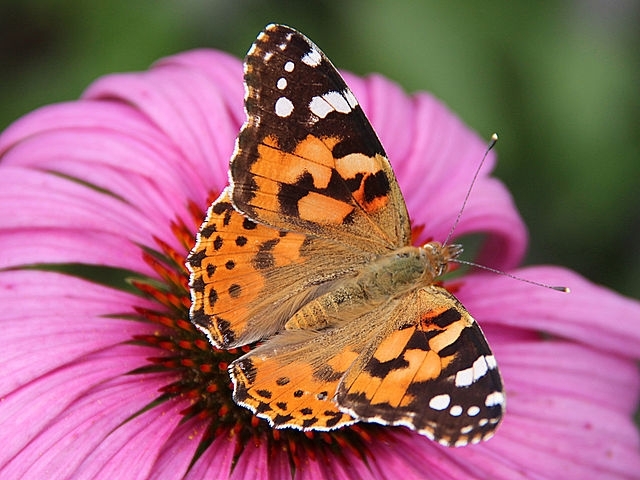 In March the annual northern migration of painted lady butterflies (Vanessa cardui) had arrived in southern California, eventually arriving in our area. No doubt you have seen those that didn't collide with my windshield in great numbers on fruit tree blossoms and and other blooms. This is a annual event, but according to Dr. Art Shapiro their numbers are huge on years that have large wildflower blooms. The last major large migration was in 2005. The Eastern Sierra is a favored path for their travels to the Pacific Northwest. It will take several generations of the butterflies to make it northward, and then the process will repeat in the autumn when they return to Texas and Mexico for the winter. NBC News down south did a piece on these butterflies. You can see it here. I always find these mass migrations of insects interesting. I am glad that in this case it's something harmless and beautiful. Two years ago, overwhelmed by carpets of wormy, windfall apples I resorted to tossing them into a large plastic stock tank that had numerous holes in its sides, remnants of its original purpose - a crawdad washing device. However, after a couple of weeks I needed the container and on tipping it over was astounded (and a bit revolted) to find that the bottom contained layers of hundreds of larvae. They were dark, grayish brown. I had not been aware of pest flies in the area, and there was no odor, but the huge numbers of larvae present gave me cause for concern. Research showed that I had just made my acquaintance with Black Soldier Fly larvae, Hermetia illucens, a species that efficiently breaks down organic material, especially the green (high nitrogen) matter in decomposing plant materials, and are considered to beneficial. The adult flies are about 3/4” long, and are shiny black, looking more like a wasp than a house fly. However, these are not a pest or nuisance fly since they have no functioning mouth parts and therefore cannot bite, nor do they have a stinging mechanism. They flit about the garden, intent on their sole purpose; finding suitable sites for laying eggs which are deposited in batches of 600-800 at a time. There are far fewer nuisance flies around when Black Soldier Flies are present since the soldier flies devour the larvae of other species, and it has also been noted that significant reductions in levels of E. coli and salmonella are present in chicken manure when it has been processed by Black Soldier Fly larvae. They like warm, moist conditions (e.g. rotting apples), and when the larvae hatch they feed voraciously on pretty much anything so long as those conditions are met; kitchen waste (they love coffee grounds), animal manure and carcasses, deserted bees' nests, and even dead fish as seen in this video: https://www.youtube.com/watch?v=DhR2jDS2IJI . The larvae are a pale beige with darker rings around the body segments, but as they mature they become a dark grayish brown. They can eat twice their body weight daily and soon convert kitchen vegetable waste into little fat bodies containing up to 43% protein and 35% fat. This makes them ideal food for chickens, and many chicken keepers farm them for this purpose. The larvae are also dried and used as food for exotic pets and fish. As they prepare to pupate, they tend to move upwards in order to leave their wet environment, searching for drier debris or soil until they mature as flies. This trait is put to good use since the mature larvae can easily be collected as they migrate out of their initial food source. They do have a downside in some situations. Unfortunately, although Black Soldier Fly larvae and red worms both like the same food, the fly larvae are extremely active, like warm, moist conditions, and tend to make the soil acidic which is not good for worms, so if you have worm bins it is prudent to check them from time to time and remove any Black Soldier Fly larvae that may be present. The frass that black soldier flies produce makes a clean, odor-free compost, but in my experience the food conversion into the body of the insect is so efficient, there is not a great volume of compost remaining! Dried larvae may also be pulverized and used as fertilizer. Many people become panicked and reach for insecticidal sprays at the mere glimpse of a black and yellow striped insect without realizing that it may in fact not be a stinging wasp, but rather a harmless syrphid fly, a native bee, some other beneficial insect, or even a harmless wasp mimic. 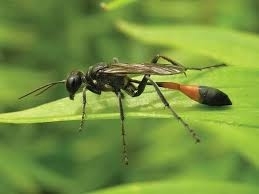 There are said to be 18,000 wasp species in North America, and only a few of these cause problems to humans. In my garden 2017 could be described as “The Year of the Wasp” with sightings of many different species, some in huge numbers, an event which encouraged me to do some research on the subject. Most wasps are beneficial since they live on a range of other insects, many of which we don't want in our gardens; aphids, caterpillars, grasshoppers and crickets, and spiders and even young cockroaches. The downside is that they are capable of stinging to various degrees, and the worst species have extremely painful stings. However, there are many which are reluctant to sting, or whose sting is not particularly painful. Vespid Wasps are social wasps sometimes known as paper wasps since they make nests of a papery material and the two species which occur most frequently in our area are yellow jackets and paper wasps. Yellowjackets (Vespula ssp.) are social wasps, but queens overwinter alone, and then find a suitable sheltered nesting site in the spring. The nest begins as a ball-shaped cluster of cells covered in a smooth papery cover. As further generations develop they add to the nest, layer upon layer until it may reach 1 foot across. We are familiar with these black and yellow striped wasps ruining our picnics as they try to carry off scraps of food from our plates, or fall into a glass of beer or a can of soda (where they might not be noticed). They have a painful sting which for some people can be life-threatening, are intimidating at best, and can become quite aggressive. Last autumn there was a huge influx of yellow jackets in the Lake Tahoe region to the point where the coniferous forests were humming with them, and sitting or eating outside became impossible. So, beneficial as these are for their insect eating abilities their nuisance factor outweighs the good that they do, and if they decide to nest around your home or in high traffic areas it is wise to have them professionally exterminated. For more information on Integrated Pest Management control : http://ipm.ucanr.edu/PMG/PESTNOTES/pn7450.html Yellow jackets and other social wasps. Paper wasps (Poistes ssp.) have similar coloring and markings to yellowjackets but are slightly longer in the abdomen and have thinner waists and have orange antennae. 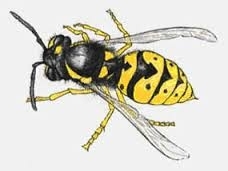 (Yellow jacket have black antennae). These are the ones that construct nests of hexagonal cells; most often under the eaves of a roof or in a porch and these nests are used for one season and rarely get larger than a man's hand. 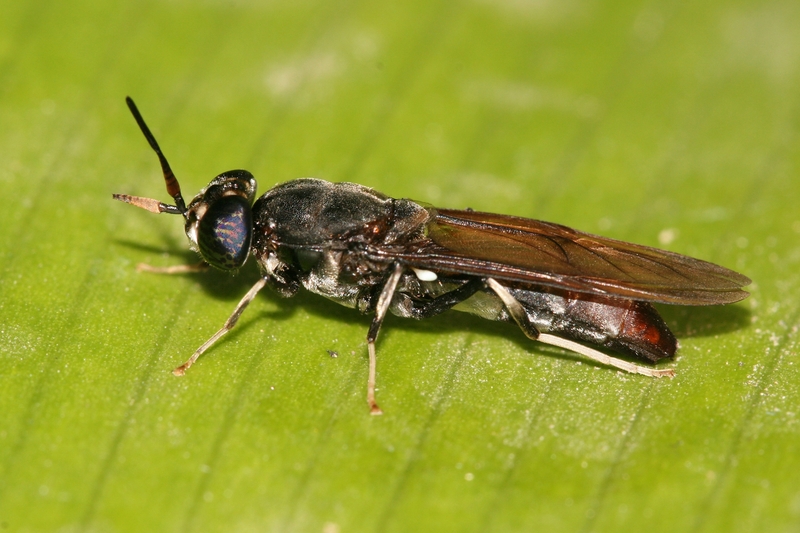 When these wasps fly they tend to leave their legs dangling as they patrol various plants in search of insects. They can and do sting, but in general they go about their business quietly, catching aphids and tending their young. In my experience if left well alone they are not aggressive, and I have never been stung by one. Naturally if they have chosen to make a nest in a high traffic area or just outside the front door, or if you are planning to paint your house, these nests should be removed by a professional. We have always left the ones that have nested around our house until this summer when we discovered that they were eating our precious praying mantis babies as those were emerging. 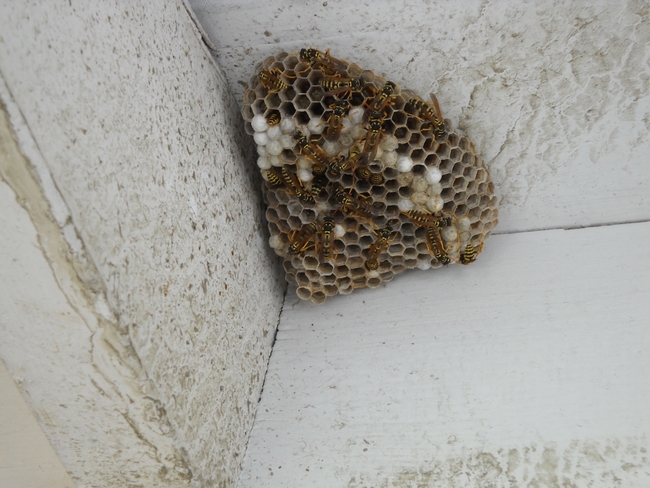 We knocked that wasp nest down after dark when they were not flying, but for days afterwards the wasps were flying around that area so we felt it best to avoid that spot until things had settled down. Common Thread-waisted wasps appeared in huge numbers this year, and when my thyme path was flowering it there were hundreds feeding on the flowers daily for several weeks. I don't remember seeing these particular wasps before. They are very thin, long-bodied wasps about 1” long with dark head and thorax and a black abdomen with a rusty-orange band around it. They were not at all aggressive and I walked on the stepping stones through this potential mine field on a regular basis and they never showed any interest in me. I actually ended up with one in my pant leg and it did not sting. These beauties are a gardener's friend since they capture caterpillars which they deposit in a tunnel in the ground, and then lay eggs on it. Their larvae feed on the caterpillar, thus destroying it. I wonder whether their large numbers were the result of the exceptional influx of striped sphynx moths that we saw in the Owens Valley earlier in the season. Female velvet ant. Photo: Laurie Christison, UC Davis equine control officer. 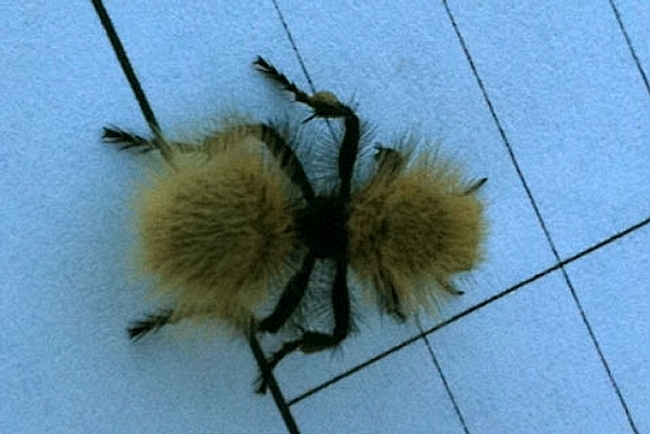 However, no good deed goes unpunished, and I recently saw a large female velvet ant in the garden. These are in fact wingless wasps (only the males have wings) and look like neither a wasp nor an ant to the uninitiated with their furry bodies which are often brightly colored although the one that I recently found was plain putty-colored. It pays to recognize them since they have one of the most painful stings known, which gives rise to their common name of “cow killers”. These wasps parasitize the larvae of the caterpillar-destroying wasps so I suspect that I shall see many more of them before the end of the season. 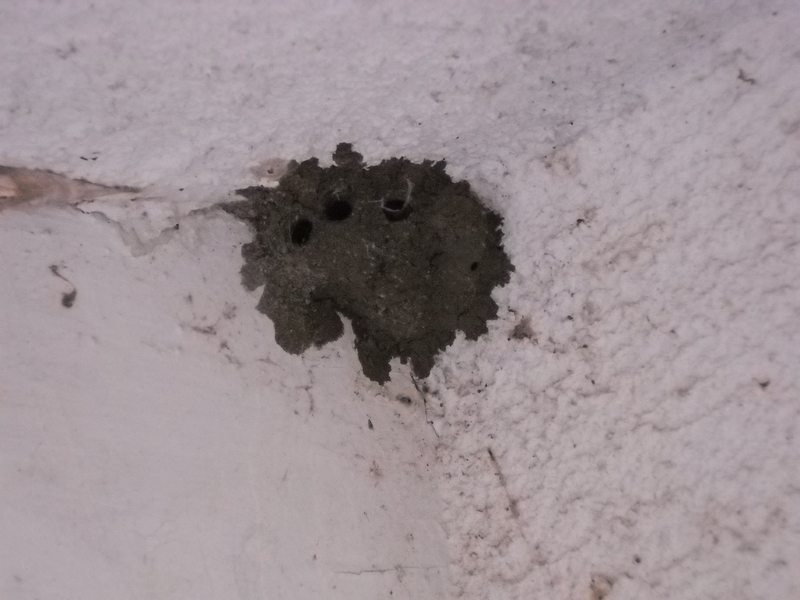 The Mud Dauber wasps, as the name suggests, make nests out of mud. These may look like clumps of mud stuck on a wall, or occasionally like carefully constructed black organ pipes stuck together in sheltered places such as garages or porches. The wasps provision their nests with spiders so are very definitely my friends! The wasps themselves are about an inch long and appear black overlaid with an electric blue color which is apparent in sunlight. Like many other solitary wasps they don't seem to be aggressive and only chose to sting if threatened. 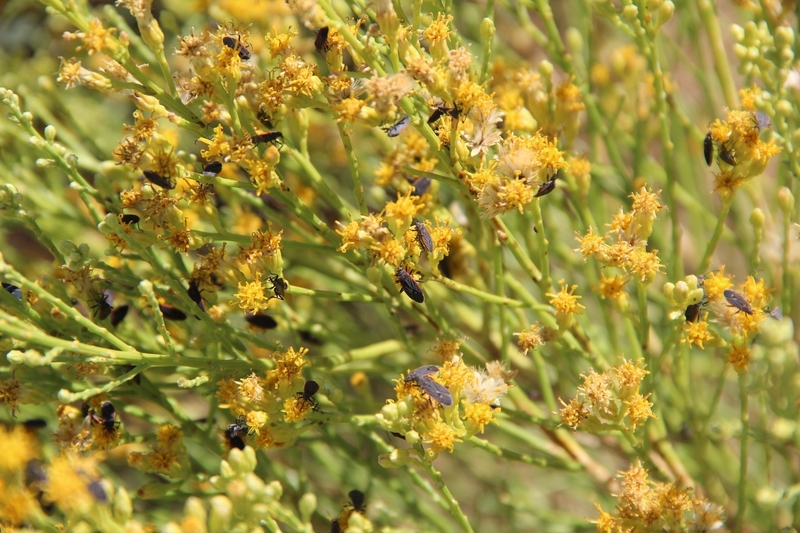 Over the past few weeks there have been numerous reports of bug invasions near Ridgecrest, Inyokern, and other cities in the high desert of eastern Kern County. Residents and business owners have reported large aggregations of bugs within their homes, businesses, and on the streets. There have been no reports of damage to agricultural crops, landscape plants, or people. However, the nuisance and paranoia associated with bugs crawling on business walls and people has led to numerous inquiries into what is going on and how long it will last. The bugs belong to a family of insects called lygaeids that are commonly referred to as seed bugs. Seed bugs use their straw-like mouthparts to extract moisture and nutrients from a wide range of plants, especially ones with seeds. The specific species of insects being found in Ridgecrest and surrounding areas is called Melacoryphus lateralis. It does not have a common name. This bug is very similar in appearance to other insects in the families Lygaeidae and Rhopalidae, such as the boxelder bug and milkweed bugs. 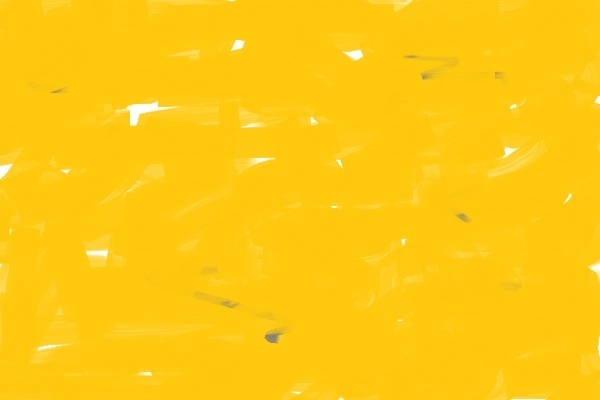 It is not a beetle. M. lateralis is found throughout the western United States and is most common in desert areas of Arizona, Nevada, Texas, and southern California. Immature and adult insects feed on native desert plants and then fly to find new feeding sites or mates when they are adults. Adults are highly attracted to lights and can fly long distances, especially in search of succulent plants on which to feed as desert plants become dry during mid-summer. Populations of this insect vary from year to year with outbreaks most commonly reported in the Sonoran Desert areas of Arizona in years with elevated monsoon-like weather associated with above-average rainfall. 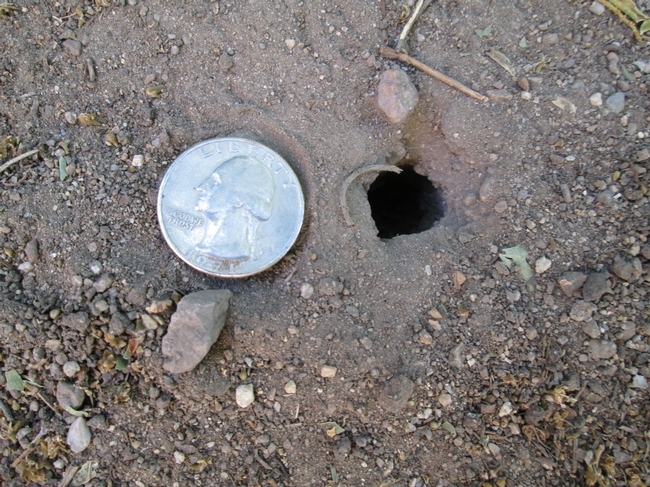 In the areas around Ridgecrest, above-normal populations of this pest in 2015 are likely the result of a mild winter followed by above-normal rainfall in February that provided ample food for nymphs throughout the desert. Then, in July and August, the combination of drying host plants and the attractiveness of lights has caused mass migrations of the bugs to urban homes and landscapes. Management of the bugs is difficult due to the migratory nature of adults. Pesticides that kill insects on contact, such as home perimeter treatments used by licensed pest control companies, can provide excellent control of bugs that they come in contact with, but are unlikely to have any residual effects after one or two days. Businesses and homeowners are encouraged to keep doors closed and turn off lights whenever possible after dusk to reduce the risk of attracting bugs. Once bugs get inside structures, vacuuming is the preferred method for their removal. Outdoors the bugs can be swept with a broom or blown away from business entrances, porches, or parking lots with a leafblower. Nobody is certain how long the insects will be around. However, reports from Arizona suggest that aggregations of adults occur in July and August, which suggests that populations are likely to become reduced over the next few weeks. These reports also suggest that the outbreaks that are occurring in 2015 are likely a one-time anomaly that won't repeat itself again unless the favorable environmental conditions for the bugs are repeated. For the sake of Ridgecrest residents, let's hope that doesn't occur. You would think that training in plants would qualify a person to give advice on, say, gardening. Actually that’s true. I do know a lot about plants but many questions I get have nothing to do with gardening. Or plants. On those cold days in winter when I wonder why I didn’t stick with that engineering degree, I can count on someone calling in experiencing what sounds like the plotline of a Stephen King novel: a quiet, single person who spends a lot of time at home is suddenly plagued by invisible biting insects with a taste…for human flesh! What they are likely experiencing is a disorder called Eckbom’s syndrome, but everyone calls it delusory parasitosis. Delusory parasitosis was first described in 1937 by a Swedish neurologist who, as you probably already guessed, was named Dr. Eckbom. Basically victims see or feel imaginary bugs. Because people with the disorder are otherwise rational, they usually seek in earnest a way to control the perceived infestation. This involves calling friends, exterminators, the health department, and eventually me. Most complaints I've receivedover the years involve being “bitten” while at home walking across a carpet or rug, or while sitting on furniture. To affected people the bugs and biting seem real, and all the evidence in the world won’t convince them otherwise. Occasionally they come to me first, but more commonly I am about their sixth choice. Arkansas was a lot more humid than here and people tended to stay inside and remain sedentary, so I received a lot of calls. The dryness here makes life tough on springtails which seem to get my clients started on the road of delusion. We also tend to get out of the house more here in the Eastern Sierra. I probably end up with these delusional clients because nobody wants to be in the position to tell a person seeing things they’re nuts to their face. So they send them to me since I’m supposed to know all about insects. I’ll get pieces of dried skin, lint, hairs, or scabs brought in envelopes or stuck onto tape. This is called the “matchbox sign” because I suppose in days of yore when matchboxes were commonplace, sufferers would bring in their imaginary pests in matchboxes. I’ve only seen a few matchboxes personally. I usually get their invisible friends delivered to me in a medicine vial or stuck on a piece of tape. Some very unfortunate people even think they have parasites under the skin. Thankfully, these people often fail to make the insect-gardening-Extension connection. The under-the-skin perception is very common with meth users and is related to the physical effects of the drug on the body coupled with psychological problems that come with drug abuse. People with the disorder do not see this as a medical problem, but an entomological one, so they often don’t see the doctor. Occasionally they do go in to seek relief from the itching. They otherwise seem rational. Winter seems to increase the frequency of inquiries I get, which offers evidence that people really do go crazy from staying alone indoors too long. Sometimes the problem is even contagious. Seriously! I’ve seen couples where both people share the same delusion. I’m told the thing to do for someone suffering from delusional parasitosis is to be kind, investigate and tell them you can’t find anything. The very worst thing to do is to agree with them. This will make the only problem worse. Occasionally I’m fast enough on my feet to figure out some way to convince them to go to a doctor, but not always. Once I had a client's doctor say that he saw them, too. I seriously doubt he saw a 1/8" long, blue creature with a dozen legs and a single horn crawing on her skin. The fact that all her scabs were on her left side and she's right-handed should have been a warning. If you or someone you know seems to be complaining about never-ending bug bites on their body from an unknown pest and no control seems to work (in fact it gets worse), the one to see may be a psychiatrist, not the Farm Advisor. I can confirm that someone has no insects on a piece of tape or in a jar, but I can’t otherwise solve the problem. To learn more about this disease check out http://delusion.ucdavis.edu. But try not to scratch while reading it. Of course, if you have a problem with real insects or mites, particularly in the garden, please contact the Master Gardener Helpline. They're ready to believe you.